As we know the outside world know us as adventure, absorbing, daunting, Stimulating and sometime Shocking. We have complex cultural diversity we have this short tour where you can explore the best of North India. Explore the vitality and grandeur that we rarely know by ourselves. Shock yourself in the history and culture of North India visit the magnificent Taj Mahal and epitome of love, Agra Fort and Fatehpur Sikri the legacy of Mughal Empire and the “pink city of India” Jaipur with glorious Forts and Palaces of India’s royal past. Upon arrival met and greet at the airport followed by transfer to the hotel. Upon arrival hotel check in. Began your remaining day to explore the Modern Capital of India and the medieval city envisaged and built of Shajahan- called as Shajahanabad. The history goes back as old as Hastinapur from Mahabharata Era. 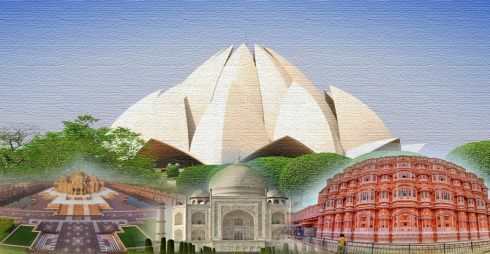 Continue your sightseeing and visit to Qutab Minar-the tallest Minaret built by bricks and stones, Humayun Tomb the first Garden Tomb of India, Raj Ghat-pay a tribute to our beloved Mahatma Gandhi later Visit to the temple of Akshardham which is sure to live your imagination high as never before. The late evening you can spent your good times sharing your experiences in one of the bizarre restaurant in Old Delhi. Later retire for the day. After breakfast leave for Jaipur named “Pink city of India” is bursting city and one of the fast growing cities of India. Upon arrival check in to the Hotel. After some relax moment visit to Chokhidhani-An Ethnic Village Resort set up with the purview of real Rajasthani Village culture in fun, entertainment, games, thrill, shopping, Rajasthani diet, Rajasthani Kalbeliya Dance or Ghoomar or folk dance, music and much more to look, to feel, to breath, to taste and to experience. Return to the hotel for overnight. Includes the Chandra Mahal and Mubarak Mahal and was the seat of Maharaja of Jaipur Sawai Jai Singh part of Chadra Mahal is now being converted to Museum but most part is still is the residence of Royal family. Near to City Palace is Jantar Mantar in fact the best and largest among several such observatory built by Maharaja Jai Singh II during 1724-1735 the biggest attraction is the largest stone sun dial of the world. Continue your journey through the pick city visit to Hawa Mahal- high screen wall built during 17th Century for observing royal proceedings on the street by the women of royal households. Later free time for shopping or personal activities. Overnight at hotel. After breakfast proceed to Agra the city of Taj Mahal and the one of the wonders of the world. En route visit to Fatehpur Sikri –a ghost cities now being envisaged and built by Emperor Akbar during 1569 to serve as the capital of Mughal Empire till 1585 but was abandoned due to lack of water. Scattered in larger areas this complex is entered through Buland Darwaza literally means “Gate of Magnificence” this is the highest gateway in the World, the many residence of queen and royal members. Continue your journey to reach Agra. Upon arrival hotel check in. Overnight at hotel. Visit to Taj Mahal during sun rise visiting during this time multiply the beauty of Taj Mahal. Return to the hotel for breakfast check out and proceed to Delhi En route visit to Agra Fort and Sikandra Fort- the mausoleum of Emperor Akbar. Continue your journey to New Delhi Airport or Railway station for onward journey. • Accommodation on twin Sharing Basis. • Buffet or fixed menu breakfast. • Exclusive AC car for all transfers & sightseeing as per above itinerary. • All permit fees, toll taxes, parking, Interstate taxes and driver allowance. • Hotel taxes applicable as of now. • Personal expenses such as laundry, telephone calls, tips & gratuity, mineral water, soft & hard drinks. • Entrance Fees & Guide charges, Insurance etc. • Govt. service tax of 3.50%. • Cost arising due to force majeure factor. • Anything which is not include in the inclusion. These safety guidelines for Rajasthan, India will prove quite useful to you if you are planning to visit this place. Here are some common dos and Don'ts for Tour of Rajasthan. • Don't forget to lock your hotel room before going outside for the purpose of sightseeing or shopping. • Never take a lift from a person you don't know. Women and those who are roaming around after dark should specially follow this advice. • Whenever you go out of your hotel room, do not carry excess cash with you. Also, keep your jewelry and other expensive items locked in your hotel room, along with your passport and return tickets. • Don't allow any unknown person to enter into your hotel room. • Always prefer to take taxis and auto rickshaws from prepaid booths or kiosks. In the other case, negotiate on the fare beforehand only. • Don't check into a hotel or guesthouse suggested by the taxi or auto rickshaw driver. • Do not consume drinks or eatables offered any an unknown person. • Go for shopping only in reputed or respectable shops. • Exchange your currency only from authorized money exchangers and don't forget to take a receipt. • It is advisable not to wear too revealing or scanty clothing. • Don't stay out after it gets too dark. © 2007-2014, BharatDarshan.net All Rights Reserved.